I find it really easy to blog about Placenta Encapsulation, probably because I am always talking about placenta encapsulation to midwives, doctors, consultants and obstetricians when I make placenta collections. Birth teams are always intrigued about placenta encapsulation and love to ask questions and gain knowledge in to why women have their placenta made into pills. At my company, Placenta Practice, we are the FIRST & ONLY company in the UK to be fully audited and authorised by Environmental Health. This makes us the only company in the UK to be officially recognised and authorised to produce placenta pills, remedies and placenta lotions. Further to this I am a qualified Phlebotomist, trained in the procurement of cord blood for storage of stem cells for future use. We are respected among hospital staff throughout London, Hampshire, Surrey, Oxfordshire, Devon, Dorset and West Sussex. One of the things I love about being a placenta encapsulation specialist is receiving texts and emails from my placenta encapsulation clients telling me how they are getting on with their placenta pills and placenta remedies. One recent client text to say she didn’t experience the massive hormonal change she did with her first baby, and that she hasn’t been as emotional or suffered from postnatal depression. She went on to say that her milk supply has been plentiful and that her skin is amazing, she’s is nearly back to her pre-pregnancy size and weight and that she generally feels fabulous. Suffice to say she attributes all these positives to her placenta remedies. Texts such as these from clients who have experienced post birth with and without placenta pill or placenta remedies validate placenta encapsulation as a great option for mummies. In the early days of being a placenta encapsulator the majority of my clients were returning mummies and mummies that have had previous pregnancies who suffered from the baby blues, postnatal depression and or low milk supply which resulted in them stopping breastfeeding early. In the last year there has been a huge change in women and their partners looking into placenta encapsulation. First time mums-to-be are looking into placenta encapsulation as more women who have had their placenta made into placenta pills are talking about the many benefits. Midwives are also seeing the benefits of placenta encapsulation and are now actively recommending Placenta Practice, and consultants at the Lindo Wing at St Marys, The Portland, UCLH, Chelsea and Westminster and many other hospital and birth centres are recommending women look at adding placenta encapsulation into their birth plan. Postnatal depression is one of the main reasons for women to look at having their placentas encapsulated and made in to pills and placenta tincture. In fact the very reason why I am a placenta encapsulation specialist is down to one of my past birth doula clients. She suffered so terribly from postnatal depression that she had to be placed into a psychiatric unit to get the help she needed. It was at this point that I had seen enough women suffer with postnatal depression and struggle with the hormonal changes in the body after birth that I took to researching and discovered Placenta Encapsulation. Four years this very day I will have been a placenta encapsulation specialist. The time has flown by and I am immensely proud of my achievements over the years. 2016 has been a particularly special year as I have made such huge steps in my career as a placenta encapsulation specialist. At Placenta Practice we are committed to the pursuit of excellence in all that we do and will continue to lead the way in Placenta Encapsulation. In March 2016 I became a qualified Phlebotomist. This makes me the only placenta specialist in the UK who is able to transport human tissue legally. We exclusively work with Smart Cells to collect stem cells and cord blood for clients who are also having their placentas encapsulated into pills. In July 2016 we became the FIRST & ONLY company in the UK to be fully audited and authorised by Environmental Health. This is a major breakthrough in the UK as many other specialist have been banned from offering the encapsulation, or are simply working ‘under the radar’ to avoid being investigated. We are the only officially registered company in the UK to offer placenta remedies. We can reassure women looking into placenta encapsulation and other placenta remedies that their placenta is in safe hands. Our purpose built practice meets and exceeds all the legal requirement. Our hygiene and safety procedures are the best in the industry. Environmental Health Officers have been so impressed with our practice and safety management system that they have rated us to be working to a “Gold Standard”. We are highly experienced in all aspects of placenta remedies and will guide you through each stage of the placenta encapsulation process. We provide in-depth information, expert collection processes and ongoing updates for your piece of mind. As well as having you placenta made into placenta capsules, which unfortunately do not last forever, I would highly recommend you look in to other complimentary remedies and lotions to placenta capsules. They all have different healing properties and uses. Amongst the firm favorites of our clients are placenta tincture, placenta balm for mother and baby and placenta essence. These placenta remedies and lotions will support both you and your baby. Placenta Tincture especially is a great remedy to complement the capsules. Some first time clients struggled when their capsules had run out, but on their second or in some cases third births these same clients are all now ordering the Placenta Tincture to reach to once the capsules are all gone. 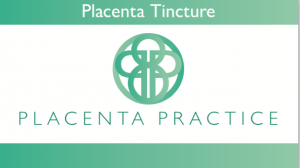 Placenta Tincture is a 300ml solution and uses a small piece of raw placenta, or cord blood (if there is any) and is full of all the goodness the placenta contains. It takes around 8 weeks to produce and is very potent so only a small amount needs to be used. A few drops in fresh juice or water, or directly on to the tongue is all that’s needed to benefit from this great remedy. So it is a definite must for all clients looking to reap the benefits of their placenta for the longest time possible!